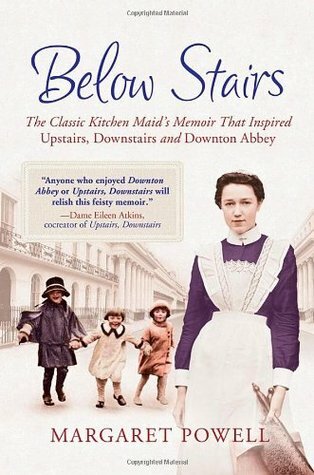 Susan Lynn Peterson’s review of Below Stairs: The Classic Kitchen Maid's Memoir That Inspired "Upstairs, Downstairs" and "Downton Abbey"
Susan Peterson's Reviews > Below Stairs: The Classic Kitchen Maid's Memoir That Inspired "Upstairs, Downstairs" and "Downton Abbey"
The cover of the book compares Below Stairs to "Downton Abbey" and "Upstairs, Downstairs." In fact, the image of Daisy, the kitchen maid in "Downton Abbey" kept floating through my mind as I read. But what this book has that the two series don't is a closely wrought picture of the life and heart of a kitchen maid. We see images of young Margaret, new to service, polishing the front door brass until her hands swell with chillblains, only to be dragged in front of the mistress of the house for a dressing down regarding the bits she missed. In Margaret Powell's stories, we see not only how tough the work was, but the toughness of mind and the emotional calluses that she needed to form to do that work. She tells the story in simple, straightforward, almost childlike prose, but the detailed pictures she painted drew me in and made me ask the question of whether I could have survived the work and the indignities as well as she did. Sign into Goodreads to see if any of your friends have read Below Stairs.